The development of the roller-crimper has provided an alternative means for terminating cover crops and planting organic cash crops into rolled cover crop mulch that serve as a primary weed suppression tool. The utilization of a roller-crimper in no-till systems is gaining popularity among organic and conventional grain growers. No-till practices create challenges for livestock farmers who incorporate manure into their soil, as valuable fertility amendments, prior to standard tillage and crop planting. In the fall of 2012, Rodale Institute in collaboration with USDA-ARS Beltsville Agricultural Research Center and North Carolina State University were awarded a USDA NRCS Conservation Innovation Grant to address the challenges of integrating manure applications into a rolled cover crop system to ensure nutrient retention for livestock farmers. 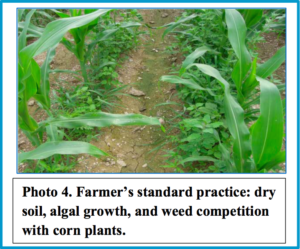 In the fall of 2013, a research team at Rodale Institute, Kutztown, PA, partnered with a livestock producer to demonstrate and evaluate the proposed integrated technology on corn production, weed management and soil health. The aim of this article is to present readers with the latest research findings from the demonstration trial conducted at the livestock producer’s farm in Kutztown, PA and in conclusion make recommendations based on information gained from this project. The team demonstrated and evaluated the impact a rolled cover crop with or without injection of starter fertilizer -pelletized poultry manure- could have on a) corn plant biomass and plant nutrient content, b) weed suppression, c) corn yield, and d) soil health. The farmer’s standard practice treatment was included in the demonstration for comparison. Cover crop mixtures of cereal rye (Secale cereale L.) ‘Wrens Abruzzi’ and hairy vetch (Vicia villosa Roth) ‘Purple Bounty’ were drilled at seeding rates of 90 lb/acre (101 kg/ha) and 12 lb/acre (13.5 kg/ha), respectively, on September 13, 2013 and grown until spring 2014. 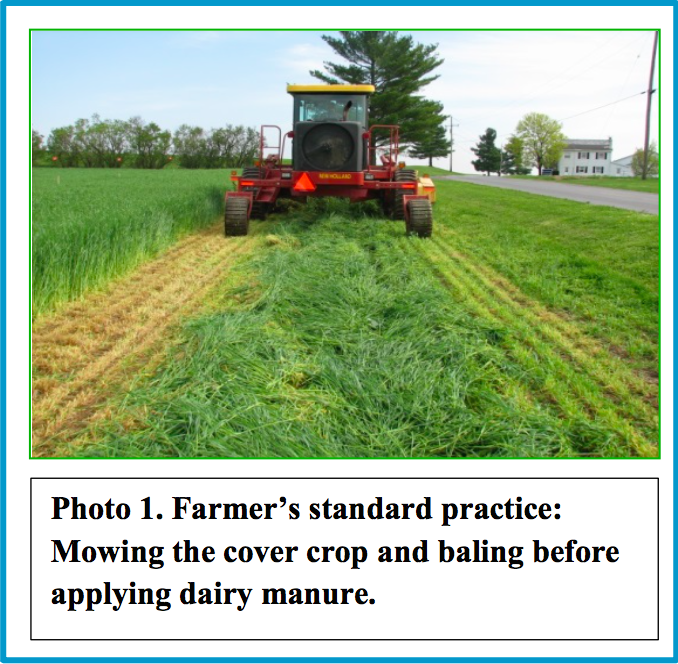 Livestock producers grow cover crops until early spring before they mow and bale the biomass to feed their animals. The cover crop was mowed on May 22, 2014 (Photo 1) and baled. The cover crop regrew (very little) until it was cut and baled on June 4th, 2014. Then, dairy manure was surface applied at 11 tons/acre on top of the green residue covering the soil. The soil was then tilled, disked twice and leveled for corn planting on the same day the other two treatments were established and planted with corn. The cover crop mixture was left to grow until June 4 , 2014 when cereal rye reached anthesis (flowering) and hairy vetch had 50% pod formation. The cover crop was rolled and crimped in the CC and CC+PL treatments. In contrast to the farmer’s standard practice, tillage was NOT implemented in the CC- and CC+PL- treated plots and the soil was not disturbed for seedbed preparation. On June 6th, 2014, the team demonstrated the rolling-crimping of the cover crop to the livestock producer, injection of pelletized poultry litter fertilizer and corn seed planting with the Monosem® corn planter in one tractor pass. The corn was planted at 36,000 seeds/acre into rows 2.5 ft apart (Photo 2). The CC+PL treatment received 515 lb/acre of pelletized poultry manure. It is important to note that in this trial a low rate of starter fertilizer – pelletized poultry manure application was used and evaluated for its impact on grain yield and soil health and to avoid loading the soil with excessive nitrogen and phosphorus levels that may lead to nutrient loss or imbalance. The mean cover crop dry weight was 11,840 lb/acre (13,272 kg/ha) in the rolled cover crop treatments (CC and CC+PL). The dry weight exceeded 7,137 lb/acre (8,000 kg/ha), the suggested value for effective weed control . 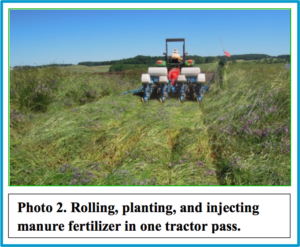 The cover crop biomass was dense which required modification of the planter to include additional weight to increase downward pressure and the addition of residue slicers to facilitate better seed placement . However, in the FSP treatment, the cover crop biomass averaged 5,034 lb/acre (5,642 kg/ha), which was removed and baled by the farmer on May 22, 2014. 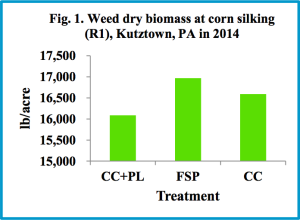 Whole corn plant biomass in the FSP treatment was 15,680 lb/acre (17,561 kg/ha) and similar to that in the CC treatment (12,729 lb/acre or 14,256 kg/ha) but greater than that in the CC + PL treatment, averaging 12,263 lb/acre or 13,734 kg/ha). Mean plant tissue N concentration in the CC and CC+PL treatments was 0.88%, whereas the addition of dairy manure in the farmer’s treatment increased plant tissue N concentration to 0.99%. In all treatments, weed biomass was sampled between corn rows at corn silking (R1) growth stage. It is important to note that in the rolled no-till management treatments (CC and CC+PL) cultivation did not occur during corn growth, whereas, in the FSP treatment the farmer cultivated four times before corn plants reached silking, a common standard practice in tilled organic cropping system. Despite that, weed biomass in the CC+PL treatment was much lower than in either CC or FSP treatments. The findings show that weed suppression was achieved in the C +PL treatment and surpassed the FSP despite the repetitive cultivations made by the farmer (Fig.1, Photo 3). The rolled cover crop mulch in the CC+PL treatment acted as physical barrier, limiting the light required for weed seed germination and weed growth [3-4]. In the no-till system, labor and fuel costs were reduced due to the elimination of certain field operations, such as plowing, disking for seedbed preparation and cultivation for weed management during the growing season. Compared to FSP treatment, the rolled- crimped cover crop mulch reduced soil erosion and loss of water and nutrient resources (field observations made during heavy rainfalls), reduced water evaporation (Photo 4) and reduced the carbon footprint. The injection of starter fertilizer enhanced seedling vigor and canopy closure (Photo 3, right), reducing the light penetration to weed seeds normally required for germination and emergence. 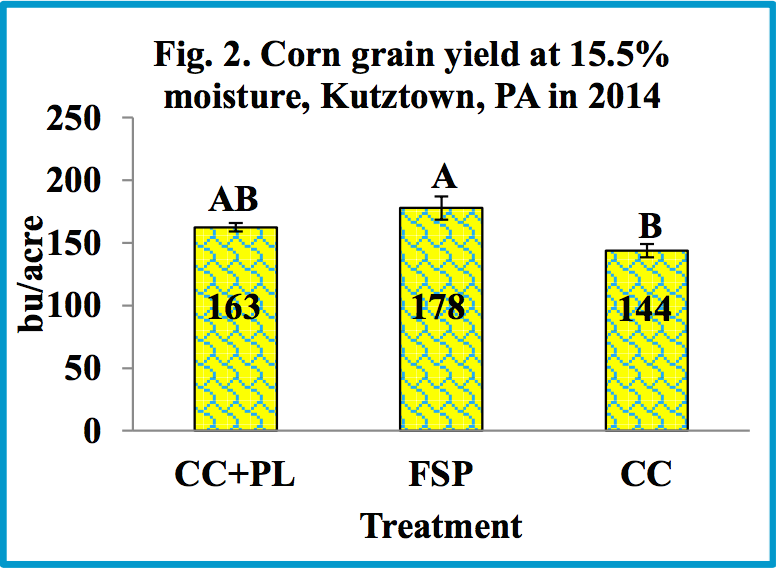 Greater corn yields were achieved in the rolled cover crop with injected poultry litter (CC+PL) treatment and were similar to that in the FSP treatment (Fig. 2). Results also show that it was critical to add an organic amendment at time of planting to boost corn grain yields in no-till cover crop-based organic corn production (Fig. 2). The addition of poultry manure increased corn yield by 19 bu/acre, which would amount to a revenue increase of $247,000 on 1000 acres of corn sold at $13/bu. 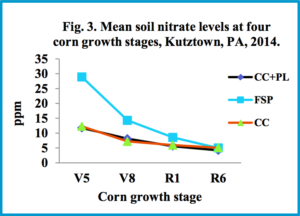 Mean soil nitrate levels in the FSP treatment were greater than those in either the CC or CC+PL treatments between V5 and R1 (Fig. 3). 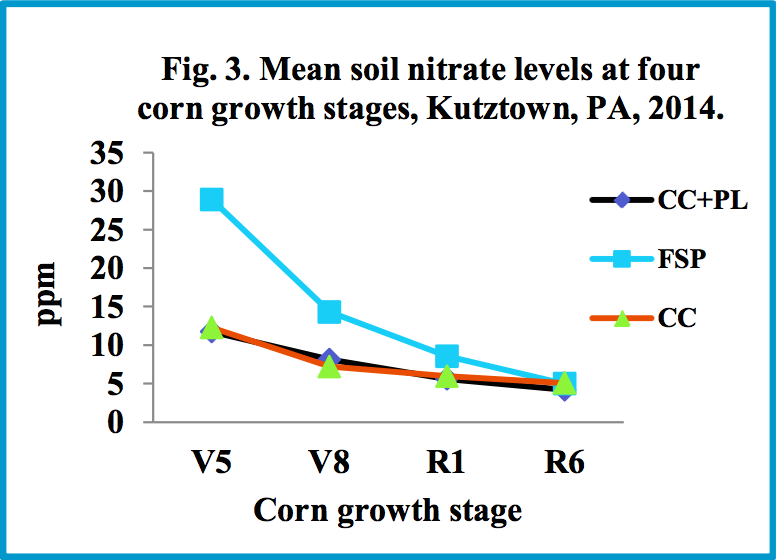 Levels of soil nitrate in the CC and CC+PL treatments were ≤ 10 ppm, the Maximum contamination level (MCL), whereas nitrate levels in the FSP treatment exceeded the MCL for corn during V5 and R1. The rolled-crimped cover crop mulch was dense and reduced light penetration at levels sufficient to reduce weed seed emergence and suppress weed growth. 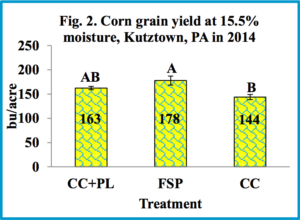 The injection of starter fertilizer improved corn yields when compared to the livestock producer’s standard treatment. The proposed system not only improved weed control and provided a respectable corn yield but also reduced labor and energy costs, conserved water and nutrients from being lost to the environment, improved soil health by reducing tillage, and provided a source of food for soil microorganisms. This trial allowed the research team to successfully demonstrate and engage the livestock producer throughout the process. In some instances, the farmer provided input on planter modifications, including extra weights to allow the residue slicers cut through the dense cover crop. The experience gained by the farmer during this trial motivated him to explore new options in designing or modifying his own equipment to implement no-till systems on his own farm. Zinati, G., J. Moyer, and G. Tant. 2015. Overcoming challenges of reduced-till organic corn. pp. 1-5. Online web article. Barnes, J.P. and A.R.Putnam. 1983. Rye residues contribute weed suppression in no-tillage cropping systems. J. Chem. Econl. 9:1045-1057.